6.75" x 4.75" x 8.5" x 3 mil Fast Take™ Soft Loop Handle Bags | U.S. 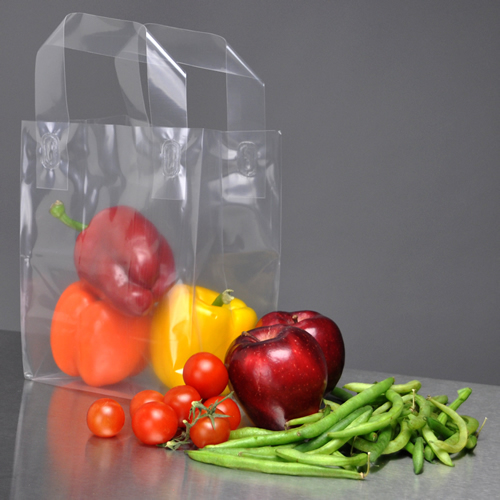 Plastic Corp.
Elkay's Fast Take™ soft loop handle bags are made from a strong and economical co-extruded polypropylene material that won't rip or tear and offers a high degree of leak protection. The deep side gussets and square bottom help the bags stand without tipping over, which helps reduce the chance of spilling, and also allows them to be filled quickly. The bags have an integrated loop handle for your customer's convenience and easy portability. Great clarity for a better product presentation. Extra wide side gussets and square bottom allow bag to stand up on its own. Ideal for carrying anything from fruits and produce to gifts and cosmetics. Integrated loop handles for easy carrying. Meets FDA standards. Sold in full cases only.